Microdermabrasion creates softer, smoother, brighter looking skin that glows. Microdermabrasion is mechanical exfoliation that removes the uppermost layer of dead skin cells using a managed spray of fine crystals, revealing younger, firmer skin under damaged skin. With the old epidermis layer removed your skin care products can now penetrate into the deeper layers of the skin and help build collagen, which gives skin its youthful appearance. Elena will evaluate your skin type to determine your eligibility for this procedure. The length of the procedure varies depending on skin condition, treatment area and the required outcome. Using the Skin Peeler Professional from Phaino we slowly spray microcrystals of aluminum dioxide (corundum powder) across the skin’s surface. The aluminum dioxide is a very fine, sand-like material that blasts away the uppermost layer of dead skin cells on the skin’s epidermis. Microdermabrasion can be uncomfortable around the sensitive tissue of the mouth and nose, but should not be painful. After the treatment we vacuum away the traces of the corundum powder and apply a soothing mask treatment. Microdermabrasion is arguably one of the most popular, painless, time-proven methods of consistent skin care that dramatically improve skin tone and texture, even after just one treatment. The results of Microdermabrasion are visible following the first treatment. *All Microdermabrasion treatments include mask, organic hydrating creams and a head massage. 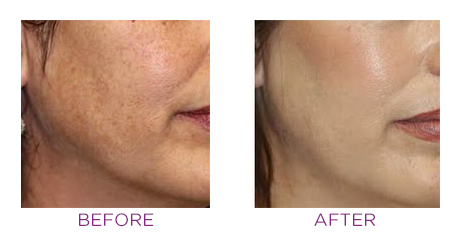 Before and after photos of Microdermabrasion treatments using our Phaino technology.